The new version of football simulator from EA Sports, FIFA 16, returns with updated teams, new modes, refined gameplay and more accurate and efficient dribbling techniques. The following tutorial teaches the best ways to humiliate your opponents with feints of the game. Now traditional feint of the game, the motion is ideal for fast and skilled athletes who can catch the unsuspecting defenders and create great scoring opportunities. How to perform Cutting Letter dribbling: hold control of the left trigger (LT / L2), press the shot button, and then quickly pass. Hold the analog left stick to one side to direct the cut for the corresponding direction. Beautiful option to leave opponents in the dust because of the quicker players, early ball should only be used when you find free space. Otherwise, you can easily lose control of the ball. How to perform Early Ball dribbling: give two quick taps on the right analog stick in the desired direction. One of the innovations of FIFA 16, the fake pass seems a mere eye candy, but if combined with other skill moves the player can trick the opponent, move with ease and to make good passes in depth. How to perform Fake Shot Pass dribbling: with the player stopped, hold the dribble button (RT / R2), press the kick, and then quickly pass. Extremely skilled players tool such as Neymar and Douglas Costa, the scooter is a beautiful dribble and very efficient, able to dismantle defenses and clear the way for easy completion. How to perform Reverse stepover dribbling: with the player stopped or moving, move the right analog stick (RS / R3) back (on the side of the player's back) and then quickly twice forward (toward the nose of the player). Other dribble widely used in actual fields, the ride was popularized by the feet of Ronaldo possession of star players, Robinho and Ronaldinho. 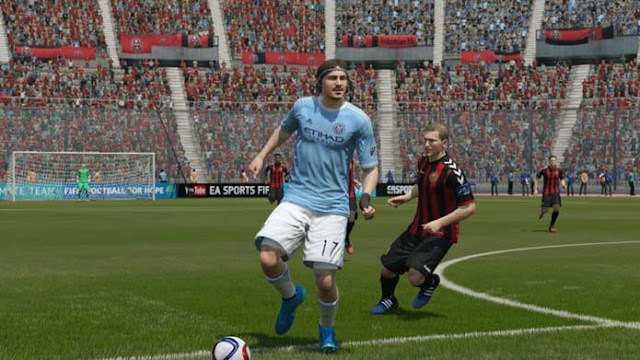 The move is also efficient and versatile option to hit the markers in Fifa 16. How to perform Pedaling dribbling: with the player stopped or moving, move the right stick forward, and then do "half-moons" from one side to the other, and then complete half a turn on the lever. Dribbling characteristic of skilled middle Yannick Bolasie, the daring feint debut in FIFA 16 and promises to be star of many great goals. The move is not easier to perform, but the effect is rewarding. How to perform Spin Flick dribbling: with the player stopped or moving, hold the right shoulder button (RB / R1), tap the right analog stick forward, and then to the right or left.